Creating your website just got easier with Vodien's dedicated WordPress hosting plans. Create corporate websites, blogs, e-commerce sites and more with our simple yet powerful WordPress platform. Instantly deploy a WordPress site with just a few clicks in your Account Manager. Easily upload your website, files and folders using any FTP client or directly via SSH. Always stay updated with the latest WordPress versions for your site. 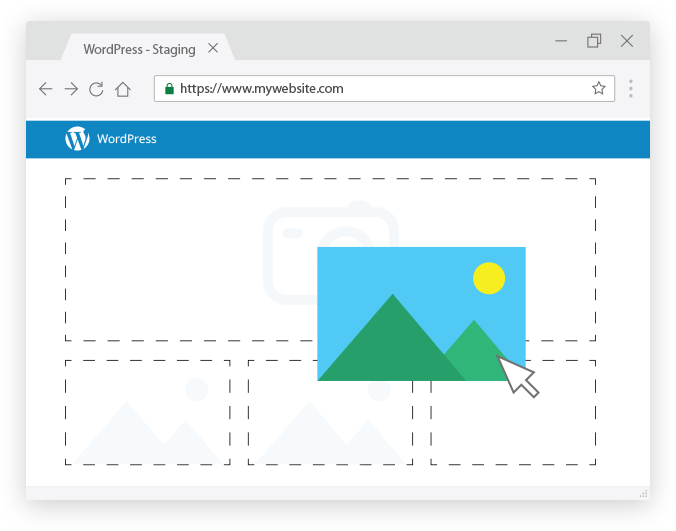 Generate a copy of your live WP site anytime on another staging environment. Test your new codes, designs or implementations and simply push it live to your production site. We stand by our 99.9% uptime guarantee for your WordPress website, and have the hardware/implementation to support that. WP-CLI provides a command-line interface that allows you to take the many actions you might need for WordPress admin. Don'y worry about what domains to use for your site! You can setup the site using one of our temporary domains and change it back easily afterwards. Our network is monitored 24/7, so rest assured that your site is well taken care of. We troubleshoot and take care of issues immediately. Link your WordPress account with our Pre-installed GIT. It provides you with the ability to create WordPress repositories, "branches" and include control changes for your WordPress sites. Vodien Distributed Denial of Service (DDoS) protection defends you against external attacks, preventing changes of site and email outages. We actively monitor for these attacks 24/7 and apply necessary counter-measures effectively. We are dedicated to provide you with the best web hosting experience. Trust in our services and if you aren't satisfied with our services, you are able to request a full refund within the first 30 days. Our automatic website backup allows you to easily restore your files or folders with just one click. Rest assured with our WordPress core auto-updater, keeping your site safe with automatic patches and updates. Optimised security setup that hardens the security for your website, everyday without rest. In-house optimised caching technology for greater scalability and lightning-fast page loading speed. Protection and speed optimisation is all covered with our curated plugins for you to further boost your site. You can easily migrate your existing WordPress site to us with just a few clicks in our Automated Migration tool. One-click to install the latest WordPress version on any domain names and begin building your site. Use our temporary domain first if you don't have a domain yet! 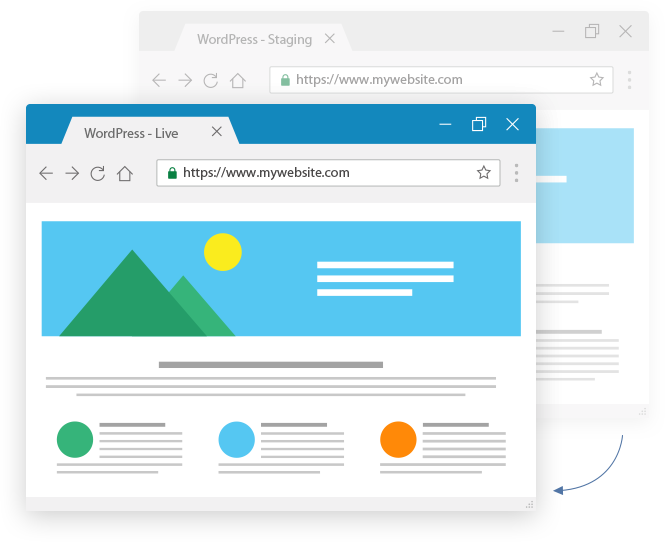 Create a clone copy of your live website to a separate staging installation anytime, with just a single click. Test any new changes you have on designs, codes, settings on more on your staging site. Once you have tested the changes, easily sync the changes to the live site with just one click. Vodien-powered WordPress plans are recommended for WordPress sites for blazing-fast speeds with top-notch reliability. WordPress is the world’s most popular Content Management System (CMS), allowing people to build websites and manage content easily. We have 80+ free premium WordPress themes and plugins that help to simplify and optimise the design and development process, with simple drag-and-drop feature. Why choose Vodien dedicated WordPress hosting? WordPress is a open source Content Management System (CMS) that allows you to create a website for blogging, business, or other purposes. It is now one of the most popular CMS in the world, providing users with the most powerful tools to create content on the web easily, even without prior technical knowledge. Why choose WordPress Hosting in Singapore? As a Content Management System, WordPress is the world’s most popular website building system, that allows individuals and businesses to create their website quickly and easily. WordPress provides you with the tools to start up your website, with a multitude of themes and plugins available for you to customise and design that website that you need. Why should I choose Vodien as my WordPress Site Web Host? Vodien provides over 80 free premium WordPress themes and plugins you can choose from depending on what you want and need. Upon signing up a web hosting account with us, you will have access to download these customisable themes to create your very own website. Can I use my registered domain for my WordPress site? You may use any of your registered domain name when creating a WordPress website. What are the system requirements in order to build a site with WordPress? The requirements for building a WordPress website are fairly simple, you just need a web hosting plan along with a registered domain name to start. All Vodien shared hosting plans allows you to create WordPress sites with no difficulty. How can I access my WordPress dashboard? You can reach your WordPress site dashboard by adding “/wp-admin” at the end of your domain name. This is the default admin URL for all WordPress websites unless otherwise configured, e.g. domain.com/wp-admin. Can I transfer my WordPress site from another hosting to Vodien? Yes, it is possible to migrate your WordPress website to Vodien. On top of that, we will be able to assist you with the shift to our hosting platform, providing free migration for 1 x WordPress website. This is only needed if there are plugins that needs modification of the php scripts. Minimum to no PHP knowledge is required to build a perfectly fine WordPress website, with free plugins and tools to assist you to build your website. How many WordPress sites can I create with Vodien’s web hosting account? You can create 1 WordPress website with wpValue, and on wpUltimate, up to 5 websites. Your WordPress website can be quickly created with just a few clicks in your billing account management portal. Do I get support assistance for my WordPress website? Our technical engineers and application specialists are ready to provide support and/or recommendations if you ever face any difficulties with your WordPress site.